Home / GST-Tally / TallyERP.9 Lessons / How to create Bank Charges entry with GST in TallyERP.9? How to create Bank Charges entry with GST in TallyERP.9? 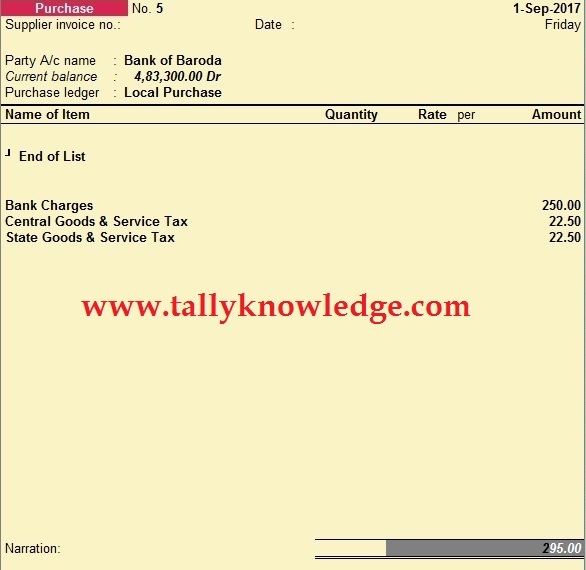 In this tutorial, we know about the bank charges or bank interest debited by bank from our account and also also charge GST on Charges / Interest and the same is deducted from our account. You can see and surprised that why i have pass entry in purchase voucher? Because tally have no option to show GST in a payment voucher. All bank must have GSTIN, it means they are not unregistered, in this case, this entry will show input credit in our books and effect our GSTR - 2. If you pass bank charges in payment voucher then you will not able to calculate excluding amount in payment voucher. Actually the amount of 250/- already includes the tax component, thus u have to enter the taxable value on which you shall be showing taxes paid or charged which is generally provided by the banks.